The center of power has shifted out there, out beyond the frontier. Find I must write yet another letter to command. Express reality out here. Out in the Last Mile of Humanity. At and beyond frontier of Rome. A frontier contracting despite all best efforts, many rivers of blood, thousands upon thousands killed. Communities and peoples wiped from this earth. Our own, generations and generations of dead. Despite how many barbarian leaders bribed, bought and betrayed. How many mercenary armies employed. Reality out here is not even replenishing our ranks with non-Romans is holding the line anymore. We’ve lost out here. You don’t wish to see it, ensconced in comforts of the Eternal City. Believing lies of those change my reports to suit the narrative, social agenda of the day. You are my friend and brother. But you served out here, obviously, too long ago. Obvious from orders coming from you and out of your headquarters there in the delusionary world Rome has become. Increasingly, your orders make me believe you still think fight out here is same as when we were much younger men. Long ago. Seventeen years ago, arriving to serve with the 11th to fight for our beloved Rome. A fight, unlike you, I never left. Truth is. World you and I, young men, naïve and over-confident in superiority of our Roman blood, fought our first battles together in, shield to shield. Our beloved 11th for a brief, glorious moment stopping and pushing back the hordes of uncivilized barbarians. Ensuring light of Rome yet shone upon the frontier and beyond. That world is no more. Long gone. So too is might of Rome’s legions. With every Roman killed, our power receding right before my eyes. Despite all many assertions to contrary from your offices, the palace and Rome’s pampered and protected elites. Not only are Rome’s legions no longer manned by Romans. Rome’s legions have long since provided little more than an ever-weakening delaying action against encroaching darkness. We no longer shine the light of civilization. The might and glory were once Rome, are less and less recognized out here. Truth is now. As you all fight and bicker among yourselves over pet causes. As lesser wolves fight over long stripped bones. Frontier no longer that very far from the great Forum. Out here in the very real-world. Power of Rome’s legions is no more. Except in small pockets. Truth is. The frontier is no longer held. The center of power has shifted and there is only one chance to save Rome at this point. Rome’s people and coddled elites need recognize Rome’s future is the many thousands upon thousands of non-Romans now comprise majority of Rome’s frontier and Last Mile armies. First part of this recognition. Rome must stop buying off her enemies, at great expense to our coffers. Enemies who use proceeds of these payments made in cowardice to fight us while oppressing and killing the families, destroying the communities of those who fill the ranks of our armies abroad. Those fewer and fewer foreigners willing to fight and die for the idea was once Rome. Second part of this recognition. Rome must begin investing in specific non-Romans fighting for her. Those still willing to fight against those Rome increasingly pays tribute to. Let us make no mistake of it. Payment made to prevent attack, is tribute. Peace negotiated and paid for out of unwillingness to continue fighting, is recognized out here for what it is. Admission of weakness, failure and surrender. Only deferring, not stopping attack. Only emboldening Rome’s many enemies. Instead, Rome must begin directly supporting those who fight for her, solid individuals, leaders who’ve stood the line with us. Those working hard to change conditions in their own lands and communities. Supporting, not through lie of Roman citizenship most don’t want. But through a revisioning of power and power elite circles out here at the frontier and beyond. Trust me when I say, Roman citizenship you peddle is of no longer of value to anyone we would have as a citizen of Rome. Only dwindling power of Rome to effect change in power structures out here, at and beyond the frontier, holds any value. Of course, this will never happen. Were Rome to support change of elite circles out here, empowering best and brightest non-elites to replace exiting elites. Rome’s own best and brightest from non-elite families might very well believe such change is possible at home. Which simply will never be allowed. A king does not kill a king. Not out of fear of divine retribution. But out of fear, piercing the veil of heavenly mandate might stir thoughts of regicide back home among the kings own people. Something we know far too well, given more than one Caesar killed in our bloody history. That all being said and understood. We in 11th will continue to fight a bit longer. Slow, as long as possible, contraction of the frontier. We are sons and soldiers of Rome and this is our duty. Despite we are surrounded by partner forces, composed of non-Romans. Forces comprised of those set against by the foreign elites Rome increasingly pays off. 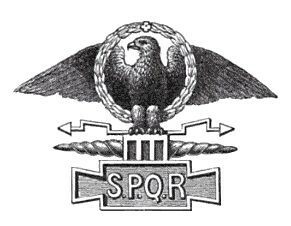 Forces with leaders and soldiers under their command ever better trained, armed and ever more angry with Rome. With Rome’s leaders and decisions. With Rome’s coddled elites, busy creating and fighting illusionary enemies. You read that correctly. A bit longer. Because soon. Even I, Commander Undefeated Claudia Legion, undefeated since our great founder Julius Caesar, will take what is left of my men. Take them from this ceaseless and ludicrous war of attrition, directed by the increasingly insane elites of Rome. Take them from the battlefield, to the East, settle into a corner of what was once the great Empire of Rome. Before our partner forces turn upon us and destroy us in their rightful anger. Yes, even I and my indomitable legions are being forced to leave this fight. Though it means certain and final destruction of Rome. I will not allow what few sons of Rome I have beneath my command, those who yet carry light was once the glory of Rome in their blood, to be destroyed to fit whims of full-grown idiot children now leading Rome. Long may the light of civilization continue within the descendants of my men! Wherever these descendants may be born in what is certain and soon, to be the former Empire of Rome.